Should I Buy Wood Shutters? Shutters can be made from a variety of synthetic materials – or from real wood! 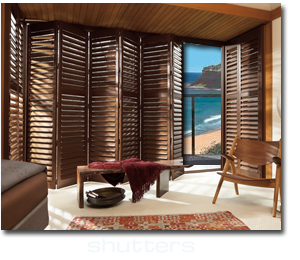 while synthetic material shutters are cheaper, wood shutters typically have superior appearance and durability. In this two part article, we’ve taken some time to explain some of the advantages and disadvantages of wood versus synthetic shutters, so that you can make the shutter purchase that suits your needs and your budget. “Engineered” wood refers to wood of one (or multiple) species being glued together to give the appearance of solid wood. Also called “Jointed wood”, this method of manufacturing shutters is generally more durable and attractive than synthetic shutters – but is still inferior to solid wood. Because “jointed” or “engineered” wood is strong and stiff for its weight, it can be used for very wide width shutters, just like solid wood shutters. But because it is made of composited lesser quality woods, it is cheaper than solid wood shutters. A primary disadvantage of engineered wood shutters is that they cannot be stained. Staining “jointed wood” shutters results in the “joint lines” becoming visible! These joint lines can also sometimes even “show through” when a painted finish is used. Lower quality engineered woods can also result in joint failure, if dissimilar materials used to manufacture the “jointed wood” expand or contract at different rates. Basswood is the “standard” or most common material used in wood shutters. It has taken over as the material of choice from pine and poplar. Lightweight, stable, durable and “warp resistant”, Basswood has now replaced Pine and Poplar as the most popular wood shutter material. Solid wood Basswood shutters can, of course, be painted or stained in any finish. And, it is an “affordable” mid-range wood product that will give you years of use for the investment. Because of its “stiffness” Basswood is recommended for shutter lengths of up to 12 feet. Unfortunately, the wood grain of Basswood is very uniform and “plain” compared to more expensive hardwoods. Also, Basswood is not particularly water resistant – making it less than ideal for bathrooms, kitchens, pool areas, or other high-moisture locales. Alder is a beautiful and durable hardwood typically harvested from the Northwestern United States. Because it is extremely hard it is among the most durable shutter materials available – and almost impossible to damage accidentally. In addition to being sturdy, Alder wood is also considered to be one of the most beautiful choices for shutters. Alder possesses a pronounced grain that is similar to cherry wood. This grain results in a stunning appearance when stained, that is unmatched by other woods. Alder wood shutters can be stained in almost any finish and also take a painted finish very well. Alder shutters are typically limited to a shutter length of 10 feet or less. Because of it’s beauty and durability, the cost of Alder wood is somewhat higher than lesser quality woods. However, Alder wood shutters are well worth the investment, as they offer a lifetime of beauty and strength.